My travels to Mount Rainier in Washington was all due to a three-day photography workshop being given by world-renowned Art Wolfe. Mount Rainier is in Art’s backyard as he grew up in nearby Seattle. Even though he has traveled the world over six times, Mount Rainier is near and dear to his heart and it’s no wonder why it is so. Even though the class description listed “minimal hiking” funny how minimal hiking to those who grew up on real mountains is a completely different thing than to those like me who live in a fairly flat terrain. So needless to say, start at the bottom of the mountain – climb up said mountain at 5,000 feet of altitude sucking air was the challenge for the day. A little way past the visitors center in Paradise, there is a parking area to the right across from a small marked trail that leads up the mountain. 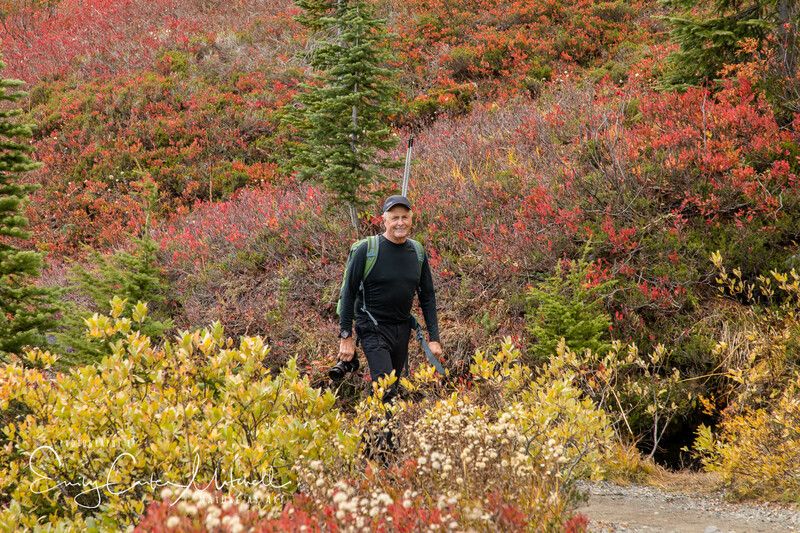 The 4th Crossing trail leads to the Skyline trail which is one of Art Wolfe’s favorite trails. It was a bright and clear day with the air crisp with cooler temperatures. 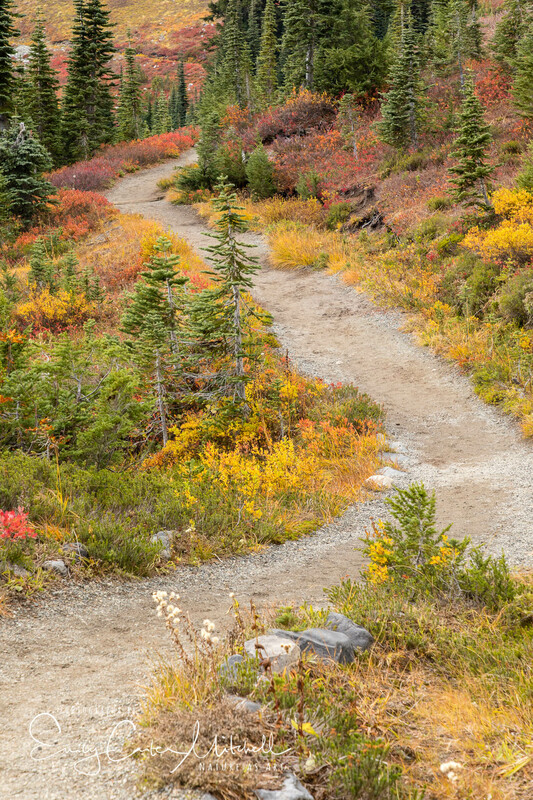 The landscape seemed to be on fire with red vegetation that carpeted underneath the evergreen trees. We were packing light without tripods and I had both my 24-105mm and the 100-400mm lens in the pack. To say that Art Wolfe is a jack-rabbit is an understatement. But I was determined to keep up with this spry mountain child and did my best to keep pace with him. After climbing about 1,000 feet in elevation gain, we stopped and waited for the rest of the group to catch up. Sitting on the ground we chatted and then Art asked me. Listen..what do you hear? It didn’t take me a moment to respond – silence. It was all quiet. Not a chip or a chirp, not a plane, not a human. The air was silent as if time had stopped. We sat quietly for a moment to take in the sound of silence which is so rarely heard. We were joined by the others and continued further to the mountain ridge. The expanse of the mountain range stretched before us and you could see the change in vegetation from one side of the mountain that received rainfall to the other that didn’t. By the time we reached the top, I was a bit worn out which is no surprise thanks to Mr. Art Jack Rabbit. So I hung back not wanting to add more footsteps while I watched the group wander the barren landscape in search for subjects to photograph. It allowed me some time to really take in the landscape and hope for some wildlife that was said to spend time in the area. 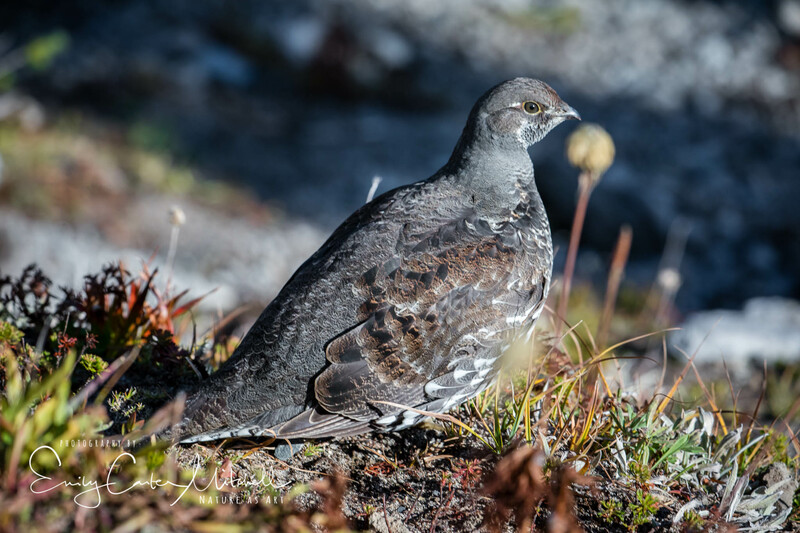 It didn’t take long before a small family group of Sooty grouse appeared on the trail. Foraging at the footsteps of a fellow photographer without a care in the world. Even though I was silently grousing to myself while powering up the mountain following Art Wolfe, I have to admit it was well worth the effort as the scenery was breathtaking. I was happy that I had packed my 100-400mm as the landscape was so expanse the only way to capture a vignette of the scene was with a telephoto lens. 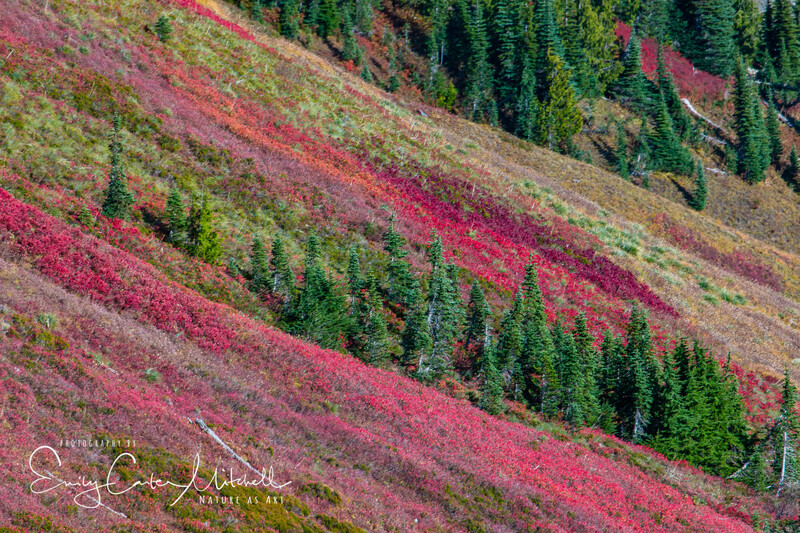 Taking my time, I worked with the fire colored mountainside with the evergreens to create a variety of compositions. 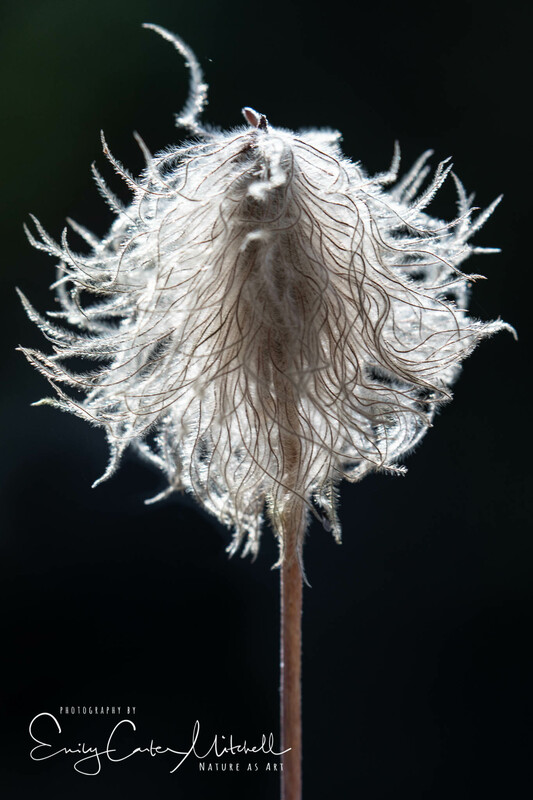 It also allowed me to do some close-up photography on some Western Pasque flower heads along the trail. Needless to say, it came in quite handy with the Sooty Grouse as well. It truly was a fantastic hike and I’m grateful to Art Wolfe for sharing one of his secret spots with us. A dramatic headland cliff overlooks the rugged coast from the end of this level trail. Sounds like a stunning view Krishna. Thank you for sharing. The beauty and moment of silence must still be lingering with you. Your photos are breathtaking, I have never seen such color! My daughter hiked the PCT through all of Washington and her photos are stunning! Yours are as well!! That is truly impressive Denise. It’s not an easy task and I’m sure the scenery is literally breathtaking. It is a beautiful park and gorgeous trails. I also hope you have a chance to visit it as well. Thank you. Wow! 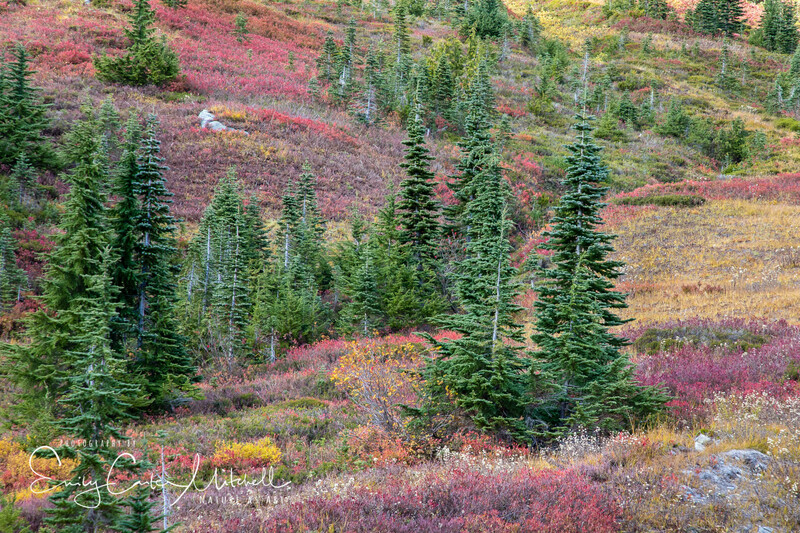 A beautiful photographic journey of Mount Rainier. I didn’t get to see this part of the part last year when we spent a few days in Rainier. Hopefully I can time my next visit for the autumn color. It’s such a beautiful place and I hope also for you to enjoy it during the autumn. Thank you Marsi.